With Mad Max: Fury Road, George Miller, creator of the original Mad Max trilogy, delivers another jolt of demented originality. Arriving 30 years after Mel Gibson drifted into the horizon in Mad Max Beyond Thunderdrome, this reboot of Miller’s seminal post-apocalyptic saga is 120 minutes of non-stop, noisy, over-the-top action that evokes feelings of exhilaration, disbelief, and exhaustion. It’s a film that hits the ground running and never takes its foot off the accelerator. I was surprised by how much I enjoyed Mad Max: Fury Road. It’s brutal and relentless, and delivers a surefire adrenalin rush. I’m going with three-and-a-half out of five. Fury Road is a relentless, action-packed assault, with not a seeming nanosecond to spare when it comes to crash-and-burn chases involving vehicles that look like they were forged in the Devil’s own backyard. The scriptwriters would have had it easy here – there’s precious little dialogue. After all, why waste words when you can make things blow up in spectacular style? There are two sorts of people who are eager to watch Mad Max: Fury Road — those who harbour a lust-fuelled interest in Tom Hardy, and geeks who have been waiting 30 years for the follow-up to Mad Max Beyond Thunderdome. The rest might wonder what’s the big deal about a reboot that has hellish jalopies and Charlize Theron at her most unglamorous. 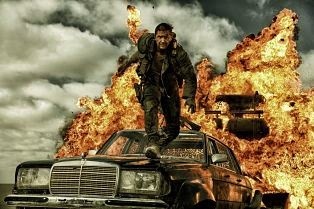 Here’s the answer: Mad Max: Fury Road could well be the best film that will come out of Hollywood in 2015. Skip it because you don’t care for dust, grubby men, almost-bald women and/ or action movies, and you’ll have missed greatness. However, at the end of it all, there is a story and there is a method to Max’s ‘madness’. In a feminist move that seems to have outraged ‘Men’s Rights Activists’, Max and Furiosa have an equal presence in the movie. Both are stellar, with Hardy playing Max as a disturbed and unhinged character who wants to do good out of instinct, and Theron (sporting a buzz cut and a robotic arm) is as good an action heroine as can be. The film may have retained its ’80s aesthetic, but its s**ual politics are more 2015 than several of its contemporaries. George Miller has returned to the franchise which spawned an entire generation of post-apocalyptic films after making animated features over the years (Happy Feet, Happy Feet 2). He is spot-on (literally with the timings of the bombs) in almost every department. 30 years after the last Mad Max film, Fury Road is not related to any of the previous Mel Gibson films. The plot is new, with many leitmotifs in between. Mad Max: Fury Road stands out due to its action sequences and camera work, never going over the top. It’s the one that will slip past post Avengers. In the time of year when movies with big explosions and little else trumps all, director George Miller’s latest film in the Mad Max franchise, “Mad Max: Fury Road,” epitomizes the summer movie blockbuster. And we are not complaining.This is definitely going to be the most beautful-looking film you’ll see this summer.